Oberon (Edward O’Blenis). 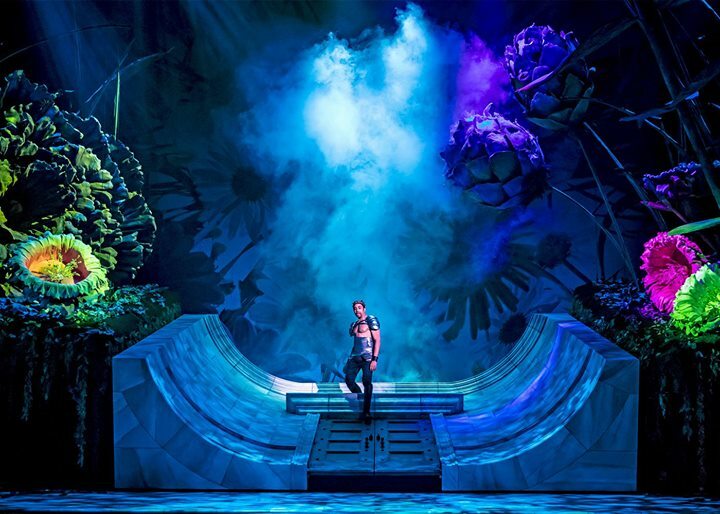 “A Midsummer Night’s Dream,” Chicago Shakespeare Theater. Photo by Liz Lauren. Happy New Year! If you made a resolution to see more Shakespeare in 2019, we’ve got you covered. Here’s what our Shakespeare theater partners are staging in January. Nick Bottom (T.R. Knight) embraces the enraptured fairy queen Titania (Alexandra Silber). “A Midsummer Night’s Dream,” Chicago Shakespeare Theater. Photo by Liz Lauren. Puck (Sam Kebede) and the Fairies. “A Midsummer Night’s Dream,” Chicago Shakespeare Theater. Photo by Liz Lauren. Hermia (Melisa Soledad Pereyra) lunges at Helena (Cristina Panfilio). Lysander (Tyrone Phillips) attempts to restrain her as Puck (Sam Kebede) looks on with delight. “A Midsummer Night’s Dream,” Chicago Shakespeare Theater. Photo by Liz Lauren. Dumain (J.L. Reed) and Berowne (Chris Hecke). 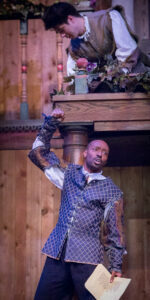 “Love’s Labor’s Lost,” Atlanta Shakespeare Company. Photo by Jeffrey Watkins. Love’s Labor’s Lost at the Atlanta Shakespeare Company runs through January 27. Love’s Labor’s is a perfect play for January: it’s about four young men who definitely do not stick to their resolutions. We’re expecting snow here in Washington, DC, but in South Florida, the Florida Shakespeare Theater is gearing up for free Shakespeare in the Park. Romeo and Juliet, running through February 2, performs in Pinecrest, Coconut Grove, Boca Raton, and Hollywood, Florida. The production is free; picnics are encouraged. Can’t make it to Florida? Just close your eyes and say “Coconut Grove,” “Boca Raton,” and “Shakespeare in the Park.” Don’t you feel warmer already? If you’re feeling romantic, catch a lecture on “Shakespeare and Love” at the Philadelphia Shakespeare Theatre on January 23. Jim Casey, Associate Professor of English at Arcadia University, traces the concept of love “from its classical roots, to its medieval ties to death, to its early modern poetic forms, to Shakespeare’s own performances of love on stage, in order to begin to answer the question, ‘What is love? '” The lecture is free with advance registration. Hamlet is onstage through January 20 at Shakespeare Dallas. It’s the inaugural production of the company’s new indoor winter season. The assassination of Caesar. (L – R) Matthew Cruz Benenson, Jordan Gleaves, Chuck Wagner, Josh Inocalla, and Christopher Joel Onken. 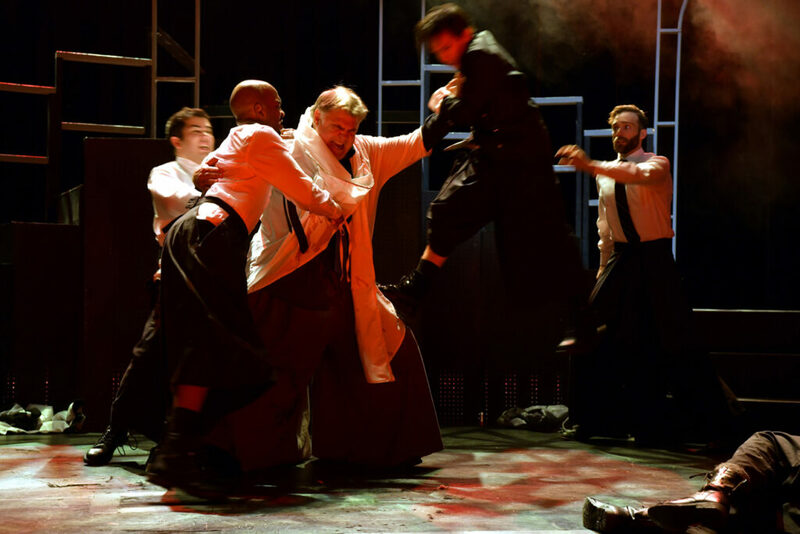 Julius Caesar,” Nashville Shakespeare Festival. Photo by Rick Malkin. I first heard Shakespeare’s words spoken at the dinner table when I asked my father if he knew anything about the Bard. . . His response to me was Antony’s “Friends, Romans, Countrymen” speech. That was twenty-five years ago and I’ve been fascinated by Shakespeare’s words, and this play, ever since. . . I continue to ask, why did they kill Caesar? Was it justified? Who were the villains? The heroes? The victors? I thought the best way to investigate an assassination that took place over two-thousand years ago was as a director. With the help of a group of actors and an incredible creative team, I know I’ll never get a concrete answer but maybe, together, we’ll get a little closer. “All’s Well That End’s Well,” Seattle Shakespeare Company. Photo by John Ulman. Ayo Tushinde and Conner Brady Nedderson. “All’s Well That End’s Well,” Seattle Shakespeare Company. Photo by John Ulman. Keiko Green and Michael Winters. “All’s Well That End’s Well,” Seattle Shakespeare Company. Photo by John Ulman. Alison Luff (Broadway’s “Escape from Margaritaville” and “Les Misérables”) as Nell in “Nell Gwynn,” Folger Theatre. Photo by Brittany Diliberto. 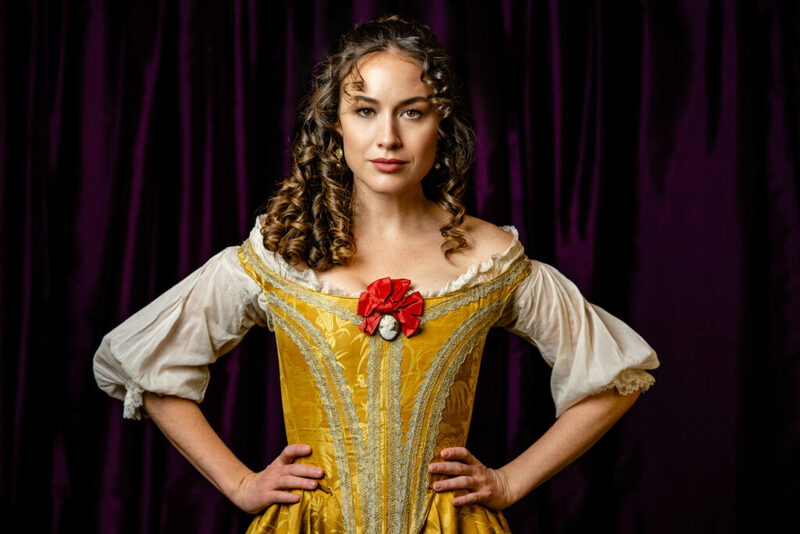 Finish the month here at the Folger: previews of Folger Theatre’s East Coast premiere of Nell Gwynn begin January 29. In Jessica Swale’s hit play, an orange seller from the streets of Drury Lane steps onto the stage and becomes the darling of the Restoration theater. . . then discovers that one of her biggest fans is none other than King Charles II. Take advantage of a Pay-What-You-Will preview on January 29, and keep an eye out for a very special one-day sale on tickets next week! Follow us on social media or sign up for our Special Offers email list to learn more about special deals. The Atlanta Shakespeare Company, Chicago Shakespeare Theater, Florida Shakespeare Theater, Nashville Shakespeare Festival, Seattle Shakespeare Company, and Philadelphia Shakespeare Theatre are theater partners of the Folger Shakespeare Library.